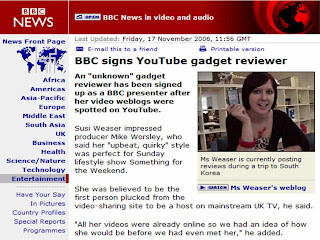 Susi Weaser - You Tube gadget reviewer signed up by BBC! 'Unknown gadget reviewer' Susi Weaser has been signed by the BBC after they saw her reviewing gadgets on Youtube! This is a great example of Web 2.0 allowing ordinary people / 'citizens' to publish their thoughts online and the appointment of Susi Weaser to 'Something For The Weekend' shows how the internet is fundamentally changing the way that the world works.